Among the joys of being in an RV is you get to be one with nature, travel and camp out. Yes it’s a lot of fun but you also need to be updated on the weather, the news and your favorite TV shows. Well if you’ve got the best RV antenna you don’t have to miss any of that, and no need to pay expensive bills either. These TV antennas are similar to the ones that you use on TVs at home. The difference is these products are constructed specifically for outdoor use, and that makes them ideal for RVs. I’ve got here reviews of the top 5 antennas and other information an RVer needs to know. Here is a quick roundup of the major points you need to look into. Receiver capacity – this tells you the extent of the antenna’s range, how many channels it can receive and the reception. Networks – all RV antennas enhance VHF and UHF signals. But many are able to pick up even more channels. Operation and installation – how easy is the antenna to install. You also have to consider the parts of the RV where it may be installed. Ease of use is crucial, and the best antennas automatically look for the strongest signal. The AT-414BC5 antenna offers the same gain as large mechanical antennas but with a more compact design suitable for RVs. With its Smartpass Technology the antenna enhances the range up to 65 miles from the source. The superior range means you’ll get more VHF and UHF channels with clear reception. You’re less likely to run into blind spots too. Once you’ve set up the antenna you can pretty much forget about it since it’s waterproof and UV proof. The installation and set up only takes minutes. The antenna uses the Smartpass Amplifier System to keep long and short range reception clear. With a 4G LTE filter the reception is also free from noise. If you’ve got another TV you can use the splitter and have reception for both. 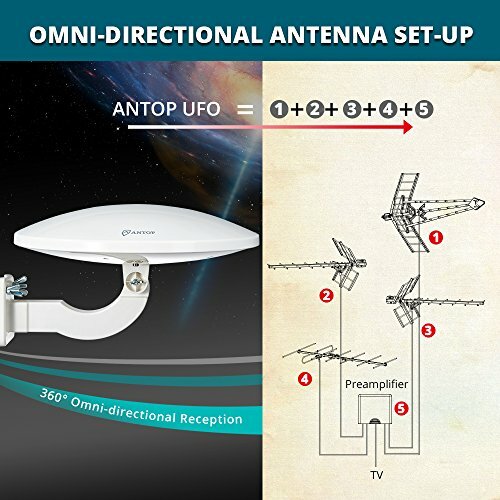 By far the most impressive feature on the Antop antenna is the amplifier as it simplifies connections and improves reception. You can also install the antenna on roof, wall or balcony of a house if you like. The Sensar IV has been optimized to receive HD signals as well as UHF and VHF channels. The unit comes with detailed instructions so you can set it up in just minutes. You can rotate, raise or lower the antenna within your rig to get the best possible signal. The Sensar IV has special powder coating to enhance durability. Thee unit was also tested for UV rays and is environment friendly too. With its amplifier the Sensar IV range extends to 55 miles. The amplifier also does a remarkable job of boosting weak signals. The unit is installed on your RV’s roof. When set you’ll get signals from the top broadcast networks and other stations that satellites cannot pick up. The Sensar IV is compatible with any TV equipped with an ATSC tuner. In fact any device with an ATSC tuner like a laptop, DVR, PCs and satellite receivers are compatible too. The power supply bundled with the unit allows you to hook up multiple televisions at once. 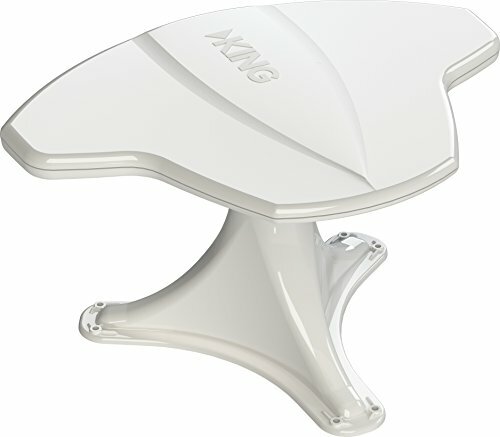 The King Tailgater lets you savor Dish HD TV anywhere you are. This antenna can be installed not just on your RV but also camp sites or your backyard. One of the nice things about the Tailgater is it automatically aims at the optimum spot so you don’t have to do a lot of tinkering. At just 8 lbs the Tailgater is lighter than other antennas so setting up is quick and easy. Just insert the antenna in your Dish receiver via the cable, hook up to your antenna and you can start watching. 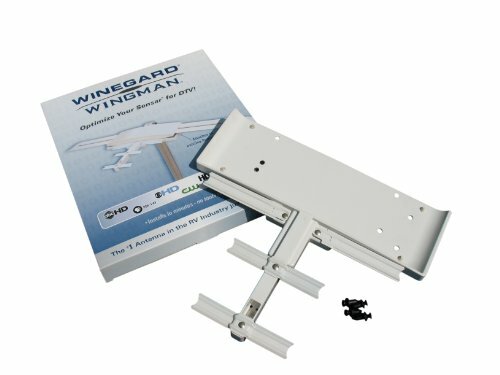 The antenna doesn’t need any extra brackets whether you install it on the roof or as a portable unit. The antenna is compatible with these types of Dish HD receivers: the ViP211k, the 411, ViP211, Solo ViP 211z and the Wally. 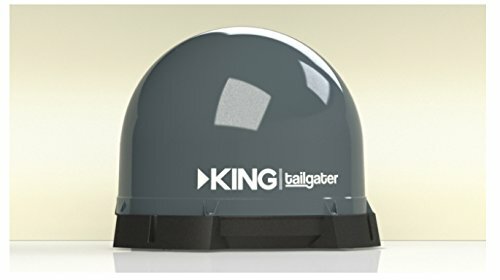 The King Tailgater takes just 15 minutes or less for Dish programming to appear and yes, you can connect up to TVs in your RV. The Wingman gives your Sensar Batwing a boost for clearer reception and better channel acquisition. You just snap the Wingman on your Sensar and the UHF signal increases significantly. You don’t need to use any tools to set the Wingman up and it works with all models from 1990 onward. All the parts have been powder coated for additional protection even when you’re in rugged environments. The Sensar antennas offer good reception and acquire a decent number of channels. But the reception and number of channels increases significantly with the Wingman. Not only is the set up quick but the reception is clear and crisp. Even if the source is miles away you’ll still get a good view. For a lot of RVers the real strength of this antenna is its backwards compatibility with older Sensar antennas. Now you don’t have to buy a new unit just to get this booster to work. If you travel a lot on your RV this will help. The King OA8500 comes with an integrated signal meter and mount for easy set up and use. Its primary feature is the KING SureLock Digital TV Signal Finder as this feature speeds up antenna aiming. With this you no longer have to resort to guesswork when channel searching. The shafts on the OA8500 allows for its use on roofs with varying thickness. Instructions are provided so you’ll be and ready in minutes. While designed for use in RVs, the OA8500 is also suitable for a travel trailer and a camper van. After setting up the antenna you just need to turn the interior handle and wait for the signals meter to reach its highest point. When it has, run a scan and you’ll get a clear reception to your favorite channels. This over the air antenna has support for HD channels. The antenna can be rotated 180 degrees so you’ll be able to find the clearest signal without getting frustrated. There are many reasons I can cite but it really comes down to this. If you don’t have a good antenna you won’t be able to watch anything on TV. An antenna ensures you don’t miss out on any of your favorites as well as the news, weather and sports. A quality TV antenna gives you access to a lot of channels, some of which your satellite receivers cannot get. These antennas pick up all the UHF and VHF channels and you get real HDTV. One of the most frustrating things about living on the road is the TV reception is spotty at best. In one town the signal may be sharp but once you drive off the channel fades. With an antenna you don’t have to get frustrated about the grainy reception. So what should you look for in an RV antenna? If you’re still not sure of what to buy here are of the things you’ll need to think about. Where do you want the antenna to be installed, on the roof or inside your RV? If you’re going to spend a lot of time outdoors, i.e camping, make sure the antenna is easy to lower and raise. Indoor antennas are more portable and easier to adjust. However the reception is not as good as that of outdoor antennas. Outdoor antennas are the ones you install on the roof. They’re larger but the installation process is not that hard. It’s worth pointing out that ordinary TV antennas will not suffice. Those are not durable to withstand RV use especially if it is going to be installed outdoors. The clearer the reception the better, right? Yes, but how do you determine that? One way is to check the range. The farther the range the clearer the reception will be even if you’re far from the source. The top antennas have a range of 55 to 65 feet and that is good enough to catch all the UHF and VHF channels. This is also good enough to get HD channels as well. You should also look for an antenna that has a high gain for a better signal. You may also want to get an antenna booster or amplifier. As the name implies they’re designed to increase the power of the antenna. Reception and range are dependent on position and the environment. To get the optimum signal the antenna must be positioned properly. The antenna needs to be correctly set up for this to work. As you may have noticed, TV antenna reception at home gets affected by the weather. The same is true when you’re in an RV. The fact that your RV is on the move makes signal acquisition even tougher. That is why you need a quality antenna. An outdoor antenna will be exposed to the elements so you’ve got to make sure that it is solidly built. Powder coating helps as it fortifies the materials used to make the antenna. The actual material used to construct the antenna also needs to be top notch. Outdoor and indoor RV antennas are made of various materials, and what you need to do is make certain they’re of the highest quality. How Difficult it is to Install the Antenna? One of the problems with older antennas is they are difficult to install. Nowadays the process is simpler. However the procedure varies from product to product so you need to choose carefully. Indoor antennas are easier to set up than outdoor antennas, but don’t let that be the deciding factor. If you need an outdoor antenna then go for that. High quality outdoor antennas don’t require much technical experience. As long as you follow the instructions you’ll have it set up in no time. The majority of cheap antennas are made of aluminum or plastic. This brings down the cost but they’re also prone to snapping. You should only buy antennas made of durable materials that can withstand the elements. This is especially true for outdoor antennas as they’ll be confronted with fluctuating weather and climate. While the range and reception are the priorities you cannot ignore the material makeup. RV antennas are versatile as you can mount them on different parts of your RV. Most are meant to be installed on the roof but you can also mount them on the hood channel, bumpers and mirror bars. While versatility is a must, ease of mounting is more important. If possible, get a compact antenna, as it makes set up easier. A compact antenna is an attractive option especially if it will be used indoors. A compact, lightweight outdoor antenna is easier to set up on the roof as well. While a light weight model is nice it should not be at the expense of the reception, range and durability. What type of TV service do you want your antenna to get? Most antennas transmit free TV, UHF and VHF along with some satellite and local stations. If you want premium content, there are paid subscriptions that you can avail of. If you’ve got a TV subscription already then you can use that receiver instead. There are different TV services and you need to make sure the antenna is compatible with it. Local stations are easy to pick up as long as your RV is within broadcasting range. Buildings, trees and the weather can affect the signal however. Small antennas are portable and can be used inside your RV. You can move it from one area to another and find the best spot. The drawback is reception usually isn’t as good as the bigger, fixed antennas. 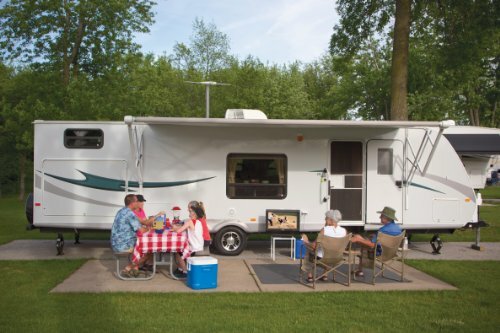 Large antennas are set in a secure location like your RV’s roof. They’re bigger and heavier but the reception and range are better. No matter what type of satellite dish you choose, make certain its view of the sky is unobstructed. An antenna also benefits from an obstruction free configuration, but you can use them indoors and get acceptable results. If you’ve got to choose between a portable or a fixed antenna for your RV, a fixed antenna is usually the better option. Once you’ve installed it on the roof you don’t have to mess around with it as it looks for the optimum reception and range. I am referring to the number of TVs you can hook up to the antenna. Most are designed for just one TV but it is easy enough to buy components that can expand its capabilities. They’re light and easy to move around. You can take the antenna out of your RV and install it on another vehicle. It is easy to move around and relocate. Indoor antennas are easy to set up. Many outdoor antennas can be lowered and raised easily. Others sport a more aerodynamic structure so raising and lowering won’t even be necessary. Once on the roof you don’t need to go up there to make adjustments. They have become easier to configure. Outdoor antennas are made of heavy duty materials. The range and reception is better than indoor antennas. When everything is taken into consideration, most will go for an outdoor antenna as the signal is better. Antennas are available in just about any store that sells TVs and other appliances. You’ll also find these in online stores and that is really your best option. You can browse and review a wide range of antennas and compare their features, prices, specs and so on. Another reason to buy online is that it is more convenient. Just a few clicks and you can place your order and it will be delivered to you. Competition has also brought the cost down while improving their features. No. If you’re going to drive, your attention must be focused solely on the road. Just as you shouldn’t text while driving, do not watch TV while you’re driving. If you really want or need to watch that show, pull over. Of course this rule does not apply to the passengers. Satellite dish antennas require your vehicle to be immobile as you’ll lose the signal with every turn. But there are RV antennas meant for use with RVs in motion. Antennas that can handle in-motion have the specs that can recapture signals. Most over the air HDTV antennas may be used while driving, but the signal strength will depend on the surroundings and if they affect the reception. Do I need a professional to install the antenna? Most RV antennas today don’t need professional installation. These devices have detailed instructions that you can follow. With outdoor antennas you may need someone to watch over you as you get on the roof to set up the antenna. If you’re not sure and fear damaging your RV or the antenna, it is better to call a professional to conduct the installation for you. Is it free TV, or do I need a subscription? Bell TV, Dish TV and Direct TV require subscription and are paid services. Dish is unique because it has a pay as you go service. RV indoor and outdoor antennas also give you access to UHF, VHF and free TV channels. Local free channels in your location are also accessible. It is possible to use your current subscription with your RV antenna, but if you use another receiver there may be additional fees. So aside from the cost of the antennas you also have to pay for the TV subscription as well. Only you can decide if this is worth the cost. What additional hardware is required? Your RV will need an HDTV to receive HD channels. A built in tuner is required to obtain UHF and VHF signals. A receiver is needed for satellite dishes. The required cables and wiring are included with antennas. Most of these antennas are designed for a single TV but some are equipped with a splitter or extra cables so you can set up another TV. It depends on the antenna. Most require a 12V source while compact satellite dishes run on a coaxial cable. The bigger antennas often come with their own power supply however. Can I use it outside of the US? Most over the air channels, VHF, UHF and satellite dishes only air in the US. There may be some exceptions, i.e. the broadcast can be viewed in Mexico and Canada, but they’re rare. Do I need an HD antenna to pick up local channels? Most if not all RV antennas can pick up HD signals from the major networks’ local affiliates, but your TV must be HD ready. An HDTV and an HD antenna ensures you get the best possible signal. What is an antenna booster? An antenna booster is used to amplify the signal of an antenna. It is a device that you add on to your antenna to augment reception. Many of the top antenna brands have a booster for their products so you get even more channels. Boosters are easy to set up. Usually you just need to snap it in place, turn the TV on and you’ll get more channels. What is a WI-Fi booster antenna? There are two types of antenna boosters. The first is set on your RV exterior while the other is on the window or desk and plugged in your computer. Either of the two is going to boost your Wi-Fi signal. This is a nice device to have around if you use your TV to browse the web. This device will only work provided you already have a Wi-Fi connection. Do I need an RV FM antenna? It may seem odd to want to want an FM antenna what with all the streaming options available. But what if you want to listen to some local music and the Internet connection is slow? That is where an FM antenna comes in as it lets you tune in to those radio stations. Installing these can be a bit tricky as you’ll need to drill a hole to install the wires. But after that the process is straightforward. How do I get DirecTV or Dish on my RV? You need special antennas which are made to pick up these services. Aside from the antenna you need to pay for these services too. The gain is in reference to the antenna’s ability to pick up signals. The higher the gain the clearer the signal is going to be. You’ll need a high gain antenna the farther you are from the source. How much maintenance does an RV antenna need? It depends on the durability and the kind of elements it is exposed to. Well known brands apply powder coating to make the material last longer. Just because you’re living in an RV doesn’t mean you have to give up your favorite shows. With any of the 5 antennas that have been reviewed here you can sit back, relax and never miss an episode of the top shows.